Andy Onello, CVP’s Director of Cybersecurity Practice, leads an industry recognized and trusted Cybersecurity organization focused on Security Operations, Cloud Security, Security Automation, Risk Management, and Cyber Defense. Andy has over 13 years of cybersecurity experience. He previously served as both the Chief Information Security Officer (CISO) and the Deputy Chief Information Security Officer (DCISO) of the Department of Homeland Security (DHS) U.S. Citizenship and Immigration Services (USCIS) and the Security Assessment and Penetration Testing Lead of the DHS Immigration and Customs Enforcement (ICE). 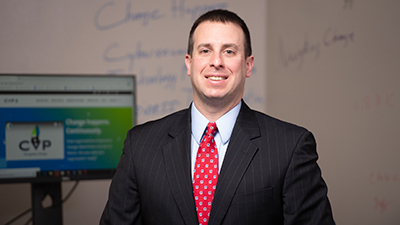 Prior to USCIS and ICE, Andy managed the Cybersecurity Section at DHS Headquarters as both a federal employee and a contractor, supporting the Information Technology Services Office for Creative Computing Solutions Inc. and Booz Allen Hamilton. Andy has a wide range of commercial information security experience leading investigations as part of the incident response team at AOL, LLC, and in public service while serving as a police officer in Fairfax County, Virginia. Andy has a BS in Computer Science from the Virginia Military Institute and is pursuing his MBA from the University of South Carolina.